If you're in the market for a new washer and dryer, you've probably got a list of the boxes it should tick. Price and energy-efficiency is sure to be at the top of your list. You also might be worried if a "2-in-1" appliance can provide the same quality as buying a separate washer or dryer. To help you find the best washer dryer combo for your home and family, we've put together a list of the top 5 available in 2019. Choosing the right washer and dryer is an important decision as you could be using it for many years. It's worthwhile spending a little bit of time making the right choice. Especially as the price can vary by hundreds of pounds between models and suppliers. In selecting our short-list, we tried to choose well-known brands for different budgets. After analysing over 200 washers and dryers, we've identified some key features to look out for. You will find that each machine comes with a capacity rating for both washing and drying, the latter of which will be lower than the former. Put simply, this is one of the most important factors when choosing your washer/dryer. For example, a machine with 5 KG capacity will be able to handle a standard load for a couple. If you have children, you will undoubtedly need a larger capacity machine. The energy rating reflect how much your appliance costs to run, and it's impact on the environment. More efficient machines are designed to use less water and to fill and empty at a faster rate. The manufacturer specifications can be quite detailed when it comes to energy ratings, so take the time to make a serious comparison. The highest energy rating for washing machines is A +++, with most being A+. However, as the dryer function consumes a lot of energy, most combos are rated "A". The best washer and dryers come with a number of programs or settings. These usually determine the length of time, heat and other factors that will be involved with your wash cycle, as well as such as spin speed. If you have children – or other family members – who play sports regularly you may want one with a heavy-duty ‘sports’ cycle. Or you may prefer a machine that has quick spin cycles, so you don’t have to wait around for it to finish. These are just a couple of the many features you will find when you begin to look at washer/dryer combos, and we recommend you take the programs available into account when making your decision. We really rely on our kitchen appliances to work - and if you have kids things are made even more difficult. Some of the more well-known brands have been in business for more than fifty-years, and it's easy to get spares in case anything goes wrong. One that comes with a self-cleaning program can also make your life easier, as it keeps everything sanitary and will save you time. A big drum spinning at up to 1600 revolutions per minute is going to make some noise! The good news is, the latest machines are much quieter than those from just ten or fifteen years ago. Even so, you can still find a 10 - 15 db difference between brands and models in 2017. To put things into perspective, 80db is actually twice as loud as 70 db! This could make all the difference if you have an open-plan home, or perhaps a sleeping baby you don't want to wake up! In our reviews, we tried to find the quietest washing machines and make sense of all the stats and specs for you. A feature that will really make your life easier is a 24-hour delay timer. This may not sound important, but it can make life a lot easier. For instance, you could load it up when you have the time and set it to run during the night, so as not to disturb you during the day, or you can program it to run when you are away for a day, and come back to a ready to clean, dry clothes. This is just a few of the main ​washer and dryer features to look out for.​There are more to consider, not least the operating costs. The following reviews give you some idea of what each device will cost to use over a given year​. Zanussi is a much loved brand in the UK, and this model offers a wash capacity of 8kg. This makes it more than capable of handling a regular load for a family of four. It has an "A" energy-rating, which is the very best you can buy. There's a number of programs and options, including a 30-minute quick wash and a 24-hour timer. Energy usage over the year is given at around 1046 kw/h, which makes it one of the better models in this area from our choice of five. The annual cost, at the time of writing, is therefore around £160. What we really like about this particular model is the sensor that detects how much moisture is left in your clothes after the spin cycle. The machine then automatically selects the most efficient drying time to save time and energy. It's also one of the quietest combos on the market with a noise level of just 51 db, and a drying level of 56 db. This is largely due to Zanussi's invertor motor design, which has fewer moving parts to make it last longer. You can learn more in this short video. Although this machine is rated as "1600 rpm" spin, it's worth pointing out that it'll only reach this speed on the cotton washes. To be honest, this is in common with many models, but people are still disappointed they can only use full-speed some of the time. Some users also find this model to be hard to use, though like many new modern appliances, it's something that becomes easier with time. Perhaps the main drawback on the laundry side is there aren't any sports, anti-allergy or baby programs. But there are programs for anti-crease and mixed loads. All in all, the Zanussi Lindo Washer/Dryer is a great choice for a mid-sized family. Beko is another brand with a good range of kitchen and household appliances, including a variety of washer/dryer combos. 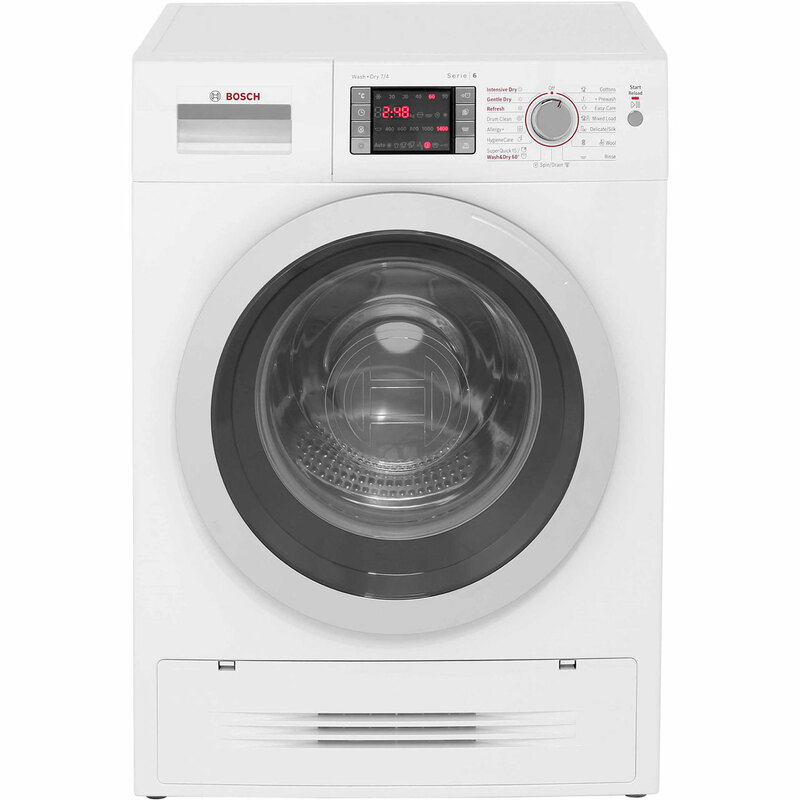 This one is a 7kg model, so will handle your family-of-four regular wash.
With an energy rating of A, and a power usage of under 1000kwh – which translates as around £146 per year – this is the cheapest and most energy-efficient of the five we have reviewed. It's also the only black one, which is sure to please those looking for this particular colour! There are quite a few features that make this model stand out. The first is the one hour "Wash and wear" program, which lets you wash up to 1 KG of clothing. Perfect if you or your kids (and it's usually the kids!) need something in an emergency. There are also some programs that more expensive washer dryer combos don't have, such as a sports program, anti-allergen high temeperature cycle and a cycle especially for white shirts. An invertor motor helps keep the noise down, and it puts out just 55 db in regular wash mode and 64 db in drying mode. This again is comparable to machines costing much more. There have been some reports of this machine rocking slightly if the load is imbalanced (a heavy towel with a t-shirt for example), so care needs to be taken when loading this one. If a 7KG capacity machine is big enough for your needs, it's hard to find a better washer / dryer combo for the money. All our of our reviews are of machines from well-known brands, and Indesit is a giant in the world of household appliances, with a fine range of washing machines and dryers. This Indesit model is very cheap but we should say it is not the most sophisticated of the group. A 7kg wash capacity is the norm for machines designed for a family of four, yet the Indesit has the highest energy usage of machines ​and is "B" rated. The low purchase cost might balance this out, but this model does have a few more features going for it. Although the laundry capacity is only 7kg, a drying capacity of 5kg is pretty generous. There are more than a few 7kg machines and even 8kg ones that can only dry 4kg. Another great feature is the 45-minute ready-to-wear program, which is great if you or your kids need something in a hurry. Likewise, this model also has "Sensor Dry" technology, which takes account of how much moisture is left in your clothes and adjusts the drying time and temperature to suit. As previously mentioned, this Indesit has a "B" energy-rating, and uses an estimated 1170.4 kw/h a year, which costs £184.97 a year. Another drawback to note is there isn't a "Quick Wash" program, which may be a deal broker. If you're looking for a low-capacity machine from a trusted brand (and can forgivee the poor energy usage), the Indesit IWDD7143S should be considered. Hotpoint has been a popular appliance brand in the UK since they first entered the market in the 1920's. This Hotpoint RD117JD is a heavy-duty washer/dryer, and the only one among our reviews capable of handling an 11kg load. That is enough for larger families, and makes this one to consider if you regularly wash for a family with more than two children. It comes in white, has an "A" energy-efficiency rating, and although it used more energy a year than the others on our list - almost 1500 kw/h - that is due to its much larger size. On the noise front, this Hotpoint washer dryer combo is surprisingly quiet at 63db on wash mode, yet one of the louder of these at 83db thanks to a hefty 1600rpm spin speed. When it comes to features you get 16 full wash programs, with a 30-minute fast wash and special stain-removal programs that may appeal to those with pets and smaller children. If you're looking for a reasonably cheap washer dryer for a larger family, it's hard to find one better. Bosch appliances are revered all over the world, and this particular washer/dryer is one of their better models. The Bosch Serie 6 offers a 7kg load capacity, which is the average, plus a respectable 1500 rpm spin speed. These specs are pretty ideal for smaller families. It is energy-rated A and uses around 1087 of power annually, at a cost of £168. This is about the mid-range of the five we have reviewed. With the Bosch, you would expect to get a fine range of features, and you do; a 24-hr delay timer, a 15-minute quick wash and a "time to end of cycle" readout - which a lot of models don't have. In all, there are 14 programs which can be selected with a dial and button system. It's one of the quietest on our list, putting out only 49db during normal wash, and 59db during drying. ​This model also allows you to choose the temperature and spin speed you'd like. People love this, as it lets them wash mixed loads incredibly fast and the clothes are dry enough to put away. Another standout feature with the Bosch machines is you get a 10-year manufacturers warranty on the direct drive motor, and a 2-year general warranty. So that's a bit more peace-of-mind there. In summary, this is a good washer/dryer from a quality brand. That is reflected in the higher price tag. But if you're in the market for a quieter machine that can wash and dry your clothes fast - this is an excellent choice. It's surprising how few of these machines there are on the market. That said, it's clear to see that some are better than others in terms of energy efficiency, wash quality, quietness and price. While the Bosch Serie 6 is an excellent choice, it is a bit pricey. For all round performance and value for money, we'd choose the Beko model.